At Candles Etc. we pride ourselves in providing the highest quality products at affordable prices. Candles Etc. is your premier source in the Southeast for earth friendly quality candles. If you’re looking for a high quality, highly fragranced 100% Soy candle, look no further. Candles Etc. 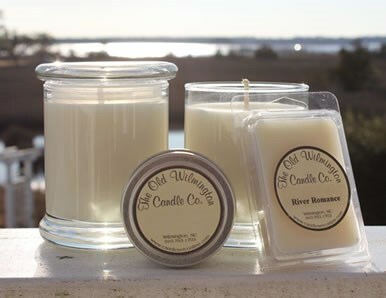 is home to The Old Wilmington Candle Company, your source for high quality 100% Soy candles that are handcrafted locally by the Candles Etc. candle artisans and available only through Candles Etc. You’ll find a large selection of candles to fit your needs. More than just candles – we provide a vast selection of unique candle accessories and creative gift items. We are proud to be home to the work of numerous local artists, including photography, art glass and rock candles. We’re constantly searching for new and different items to make each trip to Candles Etc. an interesting and fun experience. Our goal is to provide you with choices you don’t find in other stores. We invite you to visit our store to experience the candlelight ambiance, breathtaking views, relaxing music and delightful fragrances. We are open seven days a week, and look forward to meeting you!